A beautiful and refreshing drink for any occasion, this cottage style mojito is a thirst-quenching drink for a hot day and a great way to combine mint leaves, wedges, and rum. 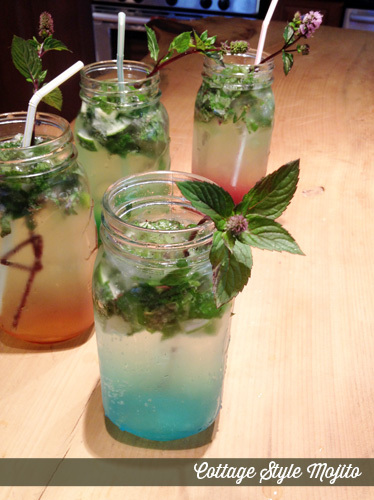 Mint leaves are a beautiful complement to this summer drink. You can experiment with different flavors and make it for a cocktail, party or dinner with friends. It is one of the best drinks for an evening of fun and entertainment. Our mojito tastes cool, and you basically need a handful of basic ingredients to fix it. And it is so easy to stir together! Place 5 mint leaves and 2 lime wedges into a jar mug and crush the lime and mint using a muddler. Add the sugar substitute (optional). Fill the glass almost to the top with ice. Pour the rum over the ice, and fill the glass with carbonated water (club soda). Stir and garnish with the remaining lime wedges and mint leaves.